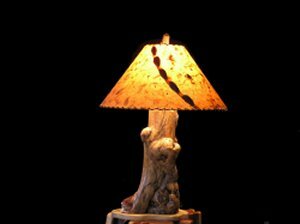 Common questions we are asked about our rustic hand made lamp shades, rustic lamps, rustic finials, sizing, ordering and more. 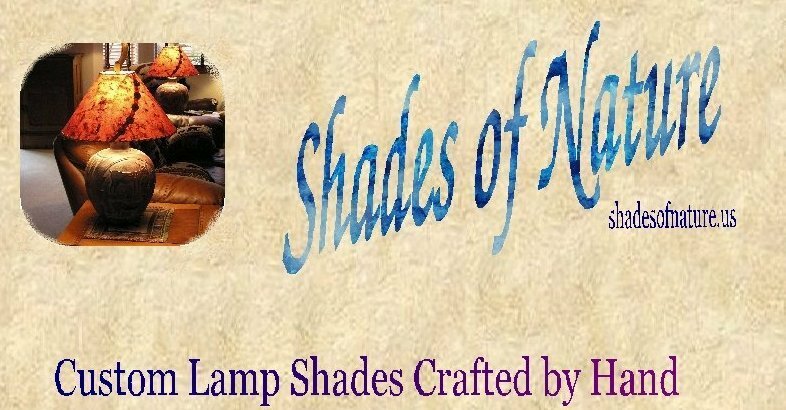 What are your lamp shades made of? The Fireside Collection and Drum Shades are made from thin fairly transparent hand made papers. They are laminated onto a special lamp shade material called styrene that protects the paper from the heat of the light bulb and gives it the stiffness needed to hold it's shape. 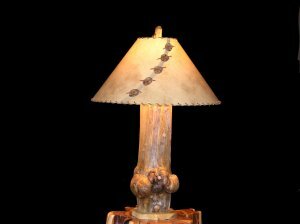 The Wildlife and Rawhide Glow Lamp Shades are made from a man made paper with the texture and look of natural rawhide. This thin paper is then laminated onto a backing called dulcote which protects the shade from the heat of the bulb. This paper choice has many advantages over true rawhide. You can use a much higher wattage bulb to get more light for tasks such as reading and you don't have the maintaince issues of never ending conditioning or having to worry about cracking. I'm not sure what size I need? This is a very common question so we have made a special page that addresses different shapes, sizes, and how to make adjustments. See Lamp Shade Sizing for help. After I place an order with you how long will it take before I get it? What if I don't like it, can I return it? Each shade order is made special just for you! We try to ship your order within 2 weeks from the time we recieve it. If we are out of stock on the paper you choose or there is some other delay we will Email you with the approximate ship date. If for some reason you aren't happy just return your order to us within 1 week and we will gladly refund your purchase price less shipping costs. I got my shades, I love them, but one was damaged. What should I do? All of the shades we ship are insured. Please call or Email us immediately and give us a brief description of the damage. We will issue a freight claim on your behalf. Be Sure You Keep All The Packaging Materials, as the shipping company may want to inspect them. Have you looked at our Rustic Burl Wood Lamps?